Florence Greaves (1873-1959) was one of Julian Ashton's first students at his Sydney Art School and also studied at the Slade School, London between 1925 and 1929. It is likely that she met Tom Roberts through Ashton. Roberts painted portraits of both Florence and her mother in the 1890s. In 1902 she married William Mofflin, a wool merchant; they divorced in 1915. Later she changed her name by deed poll to Florence Turner Blake after her great-grandparents and in honour of the artists she most admired. Several watercolours by her, influenced by Charles Conder's fan designs, are in the Gallery's collection. When she died she left almost all of her estate to the Art Gallery of New South Wales, at the time the largest bequest by an individual to the Gallery. 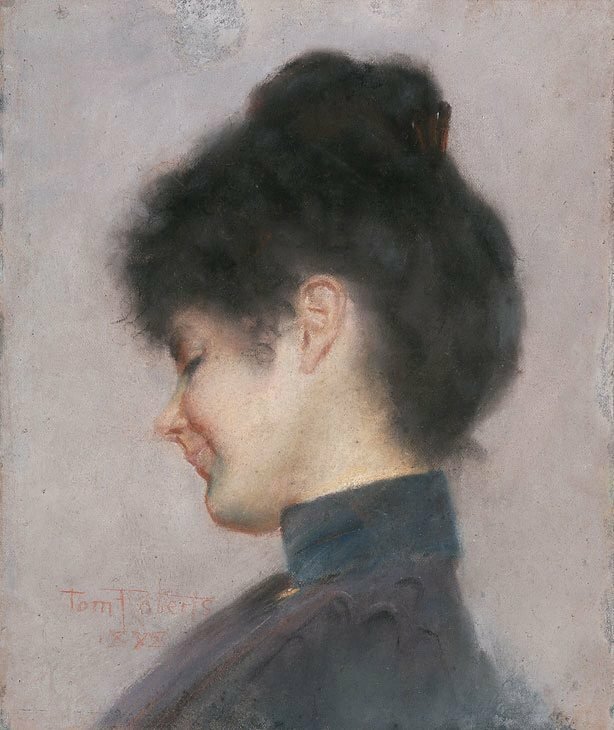 Included was Tom Roberts' much admired painting of her and this pastel. Funds from her bequest are still used to purchase works for the collection. Signed and dated l.l., red pastel "Tom Roberts/ 1898".